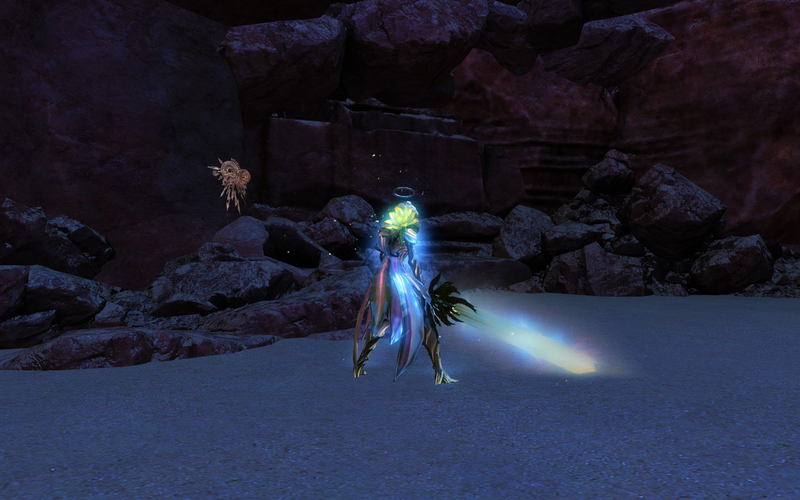 It turns out that you can’t name your Ranger pets after ArenaNet developers. I thought it might be amusing as Bobby Stein and I waited for the other party members to rename my Reef Drake after him. Sadly I wasn’t allowed and instead settled on Bobby. It transpired that Bobby, the Reef Drake, would be our saviour throughout our play session together and along the way cause more than one problem by photobombing every screenshot I wanted to take. Joined by both Bobby Stein and Elisabeth Kerstein to play through Episode 6, the premise of them joining me and a couple of other European press was to be on hand to answer any immediate questions that might arise. I’d resisted the temptation to play Episode 6 when it launched because I wanted to experience it alongside the ArenaNet team. I’ll freely admit it’s quite an unnerving experience playing a games content alongside its creators because you don’t want to offend should you seek to criticise something, appear to play the content too quickly or act entirely incapable when you’re downed multiple times in a row. While we might have been plagued by serial latency issues in The Silverwastes that saw our party go separate ways (Bobby and I ended up playing together and Elisabeth played alongside the other press participants) I’d have to say that Episode 6 is not only a great deal of fun but is perfectly short and sweet. While I’ll get to the fact it’s short later on, I think it’s important to remember that the Living World content should be viewed as a whole rather than compartmentalizing and judging just the ‘story’ component. As you might expect Episode 6 kicks off right where we left off with our band of adventurers meeting up in The Silverwastes to discuss the discovery of Glint’s egg and the fact the Master of Peace has it. During the first story instance after a message from Logan you meet up with Destiny’s Edge in Camp Resolve. I have to say that I was so glad to be back in their company and although it’s brief it’s great to see these characters worming their way back into the storyline. Although you only get several minutes with Destiny’s Edge before we’re tasked to find Taimi, the conversation is brisk and to the point. It turns out we’re on the hunt for the Zephyrite masters. It’s at this point that I was expecting some form of easter egg hunt similar to what we’ve had previously and although it isn’t unpleasurable to be lead by the hand to the Zephyrite’s breadcrumb trail, the scope here to provide players with some autonomy in the search would have been welcome. I’m not suggesting that you say “Here’s The Silverwastes, go and find the Zephyrites and their clues!” but gentle indicators as to the general area of their trail. The first clue was already provided to the player as you were informed the Zephyrites left via the Southwest gate and subsequent clues could have simply stated “Their footprints head Northwest towards Red Rock Bastion” before placing an indicator marker of where the next clue could possibly be. This would then leave players with an area where they had to conduct their search. A simple change such as this would have elongated the search process and added greater importance in locating the Zephyrites. Admittedly it’s a difficult balancing act for ArenaNet because on one hand I’m sure they don’t want to make the Living World story progression too easy but then they’re always going to be battling against people who will seek a guide instead of finding answers for themselves. There’s no right or wrong answer here but I’d like to think some middle ground could have been found for those wishing to be more involved in a search. After finding the Zephyrites trail and discovering an underground passage you face what I’d argue is the hardest Living World enemy to date. I’d like to consider myself an experience player but like most enemies in The Silverwastes the Mordrem creature lurking within the cave is incredibly strong. It certainly doesn’t help that I’m in a full set of Berserker gear but being killed in two hits certainly keeps you on your toes. As far as encounters go I really loved this boss. It’s movement wasn’t entirely predictable, you couldn’t tank and spank it and the variety of its skills available kept you guessing its rotation. I’m still not entirely sure why the Zephyrites were in here but I’m assuming it’s because at one stage The Master of Peace was holed up inside and since his leaving, the Mordrem creature took up roost. I’m just grateful that Bobby (the Reef Drake) was on hand to keep me and the real Bobby Stein alive. With another character losing their life to Mordremoth’s reach it’s good to see that ArenaNet aren’t afraid to kill off the surrounding cast. We aren’t quite reaching George RR Martin territory where no one is safe but I’m still hopeful there’s time for Brahm and Rox to be eaten alive or strangled painfully by creeping vines. On the subject of Brahm, Rox and the remaining others it isn’t until you track down the Hidden Depths Waypoint by diving into a Skritt Tunnel that the Episode really kicks into gear. Not only is the Labyrinth one of ArenaNet’s best looking locations (it really is visually stunning) but the tone is significantly different. The atmosphere inside the Labyrinth seeps out of the enormous vine barriers to the point where you genuinely feel claustrophobic. If that wasn’t bad enough there’s also a Mordrem Lurcher stalking the pathways hell bent on hunting you down that even when killed will return again and again. It’s a brilliant concept and one that works incredibly well. It isn’t particularly easy to navigate the Labyrinth and the Lurcher is a challenge to kill. By the time you’ve cut your way through the vines to rescue your missing friends and reached the centre of the Labyrinth the boss at its heart is also pretty tough. Once again I died a few times and oddly none of my companions that I’d so kindly rescued wanted to resurrect me. Perhaps they sense I dislike them but fortunately, Bobby-the indestructible-Reef-Drake came to the rescue once more. With the conclusion still very much left open after Caithe steals Glint’s egg and once again after the death of another prominent character bits the dust, there’s still plenty of unanswered questions. What is Caithe up to? What was the Master of Truth doing inside the Labyrinth? Where is Rytlock? What will Destiny’s Edge think when they find out Caithe stole the egg? I expect we’ll now be drip fed further answers in Episodes to be released after Wintersday. Coming back to my original observation that this episode is short, I’d have to say that it is but that isn’t a bad thing. In total it probably took me around an hour and 30 minutes to complete while taking a couple of detours to stay inside the instances to listen to additional dialogue the cast members had to say. I think that’s perfectly fine for a single Episode because when viewed in its entirety, there’s still enough here to keep me occupied long after Caithe steals the egg. If I was to speed run the Episode I’m sure I could complete it in 30 minutes. To write off an Episode based purely on its length does a great disservice to what is on offer here. There’s some great storytelling, the boss encounters are excellent and the Labyrinth alone is worth the playthrough. Combined with the PvE version of the Labyrinth outside of the story instance and the achievement chasing, there’s hours worth of activity to partake in. I think what people need to remember is that the Living World is an accompaniment to your day to day gameplay: it isn’t designed to be the sole purpose of play. As someone who has invested well over 2000 hours into Guild Wars 2, I’ve a list as long as my arms of things I still need to do. To play a Living World Episode is a wonderful break and the period in between often gives me more than enough time to work down my “To Do” list. Is Episode 6 as good as 5? I’d say yes and just like Episode 5, it's well worth the playthrough.